R. Albert Mohler Jr, President of the Southern Baptist Theological Seminary, called Donald P. Hustad “one of the giants of Christian music of the 20th century–an almost iconic figure whose personal ministry and professional artistry were combined in such a powerful way.” Billy Graham, world-renowned evangelist, described Hustad as “a man who lifts-up his voice in prayer to the One whom we worship through music.” During his ninety-four years (1918-2013), Hustad served with distinction as a musician, educator, author, organist, conductor, and professor. He was an evangelical Renaissance man. In the fall of 1960, as a student at the Moody Bible Institute, I wandered into the music department and saw Dr. Hustad from a distance. He was an imposing figure: distinguished in appearance, strong and dramatic in voice, and emanating the charisma of a born leader. My immediate response was a combination of respect and fear. I was afraid to audition in front of him for the Moody Chorale. I settled for singing under his direction in Handel’s Messiah in the Oratorio Chorus. I did not have to audition for that particular choir. I attended his yearly Christmas concert, “Candlelight Carols.” As a young, impressionable student, I reached a point where I was in awe of him. Hustad was definitely a major presence at Moody. I paid my tuition by playing piano and organ at Moody’s radio station, WMBI. I participated in doing live radio in those days, which precipitated many harrowing and humorous events. I was literally improvising on the air for the city of Chicago and beyond. It was a high-wire act without a net. During that same time period, Hustad decided to leave the chair of the music department and to play organ for the Billy Graham crusades all over the world. He was yet to play a further, significant role in my own musical journey. In the 1970s I was working for the Zondervan Corporation as a composer, arranger, and editor. We asked Hustad to come and be a guest musician/lecturer at some of our major musical conferences. Some of these were held at the Bibletown Conference Center at Boca Raton Florida. It was there that Hustad and I worked together and became close friends. We would comment on each other’s lectures. I would accompany him as he conducted the delegates who formed one large choir. I recall playing his work, The Gospel Bard. It is a musical romp through church music history, involving music and script. I remember asking him if he wanted me to play his score note for note or if I could have fun with it. He chose the latter, and yes, it was great fun! Hustad wrote many keyboard works for Hope Publishing Company and also for the Zondervan Corporation. On one occasion we arranged a piano and organ duet collection together. I blocked-out the arrangements and he would fill-in his organ part. It was a musical conversation-taking place between Louisville, Kentucky and Nashville, Tennessee. Sometimes, Dr. Jerry Aultman and I play these for various events at Southwestern Seminary now. Several times during the 90s, I would drive to Louisville and would take Dr. Hustad out to lunch. Afterward, we would retire to his house study for the rest of the afternoon. We had many intense and stimulating conversations about music and worship there. One time, he was in his closet with some files and was waxing eloquently and loudly about the word, sacrament. He loudly proclaimed, “What do evangelicals know about sacrament?” It was as if he were speaking to a cast of thousands instead of just the two of us. It both instantaneously shocked and amused me! I recall it vividly. A few years ago, when I was already teaching church music at Southwestern Baptist Theological Seminary, I called him on a whim. We conversed for around thirty minutes. I was amazed at his energy and vitality. He was then already in his nineties, and he was still involved and engaged with music and worship. He expressed his great joy that I was teaching at Southwestern. Those words of encouragement and affirmation were his last words to me. They touched me personally and profoundly. Hustad has left us an extraordinary body of work. He was music editor at Hope Publishing Company for fifty years. He edited nine hymnals including The Worshipping Church (1990). His best-known scholarly work is Jubilate! He composed elegant choral anthems and arranged poetic and reflective keyboard arrangements. He was the organist for the Billy Graham crusades in the 60s and 70s. 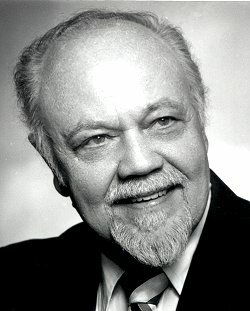 He became a highly regarded Professor of Church Music at Southern Seminary for over thirty years. He spent his life interacting with, elevating, and expanding the discipline of Church music. Finally, Don Hustad was also a solid, dedicated family man. He was married to Ruth, wife, homemaker, and research assistant, for over sixty years. Their marriage produced three, lovely daughters: Donna, Sondra, and Marcia. Don and Ruth finished their life journey within three weeks of each other in the same assisted care facility. Good night, Don and Ruth. We will see you in the morning! Don, thank you for these reflections on one of the most extraordinary church musicians of our time. Hustad was certainly a hero to many of us.